Population growth and limited supply continue to underpin the private rental sector, but rents rose at a slower pace during the first half of the year than in 2015, the HomeLet Rental Index reveals. The East Midlands region saw one of the largest increases in rent during the period June 2015 to June 2016. The 8.2% average increase in rent was equalled only by the East Anglia Region. Rents in the East Midlands now have an average of £648pcm according to figures released by Anderson's referencing and specialist insurance partners Homelet. Rents outside London rose by 3.5 per cent over the three months to the end of June compared to the same period of 2015, while London’s rental market saw increases of 3.9 per cent. 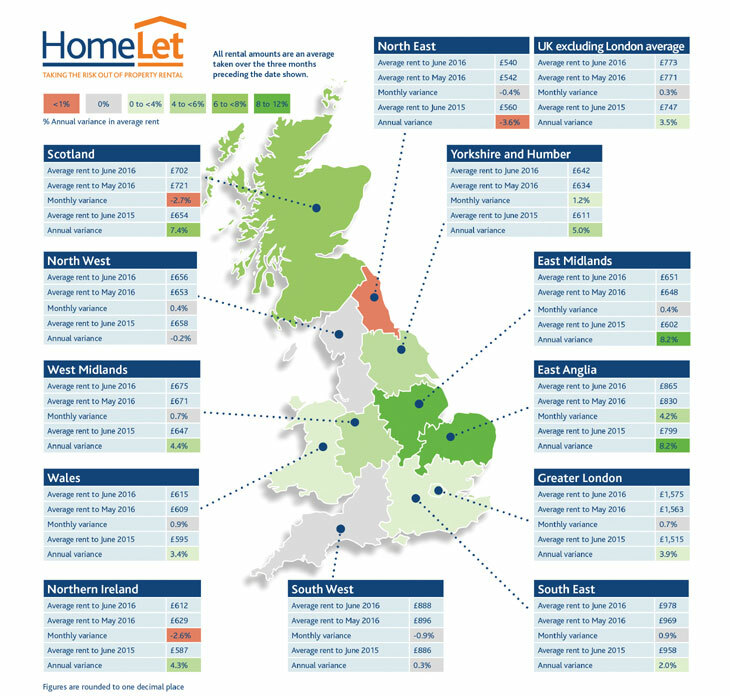 Rents were up in 10 out of the 12 areas monitored by HomeLet showing an increase. However, the pace at which rents are rising has fallen back, with monthly increases now back at levels last seen in the second half of 2014. June’s 3.5 per cent increase for the UK excluding London compares to a rise of 7.8 per cent registered in June 2015. Last June’s figure for the capital was 10.1 per cent. The rise in Stamp Duty on buy-to-let property purchases in April led many landlords to complete purchases before the higher rates came into force – resulting in a spike in supply during May, as these properties came on to the rental market and this may have suppressed rent increases. Looking ahead, the impact of the UK’s vote to leave the European Union will be one factor for property investors to consider. Many economists believe one impact will be a slowdown in construction, which would mean that fewer homes become available for rent, further constraining supply. It is also possible that demand for rented property will remain strong as would-be house buyers wait to see how prices are affected by Brexit. More broadly, the fundamentals in the private rental sector are unchanged: the growing population and limited housing stock means an ongoing imbalance between demand and supply. Subject to affordability, that is a recipe for further increases in rents. Across the UK as a whole, excluding London, the average rent agreed on a new tenancy now stands at £773 a month. In the capital, average rents have risen to a record £1,575 a month.